Fresh tomato recipes are not only delicious but full of anti oxidants. Fresh tomato recipes are not only delicious but the red coloured lycopenes are full of anti oxidants. As you probably know the red colour in tomatoes are lycopenes that are powerful anti cancer substances. In fact, men who eat a tomato a day have 50% protection against prostate cancer, the meanest and most malignant of male tumours. 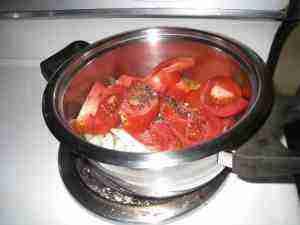 Cooked and raw tomatoes give protection against cancer, and not just the prostate. 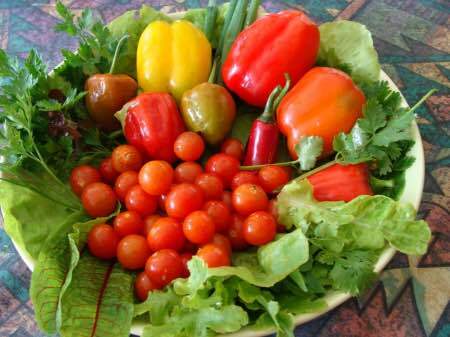 As you almost certainly also know, it's very widely published, we must eat at least five coloured fruit and veg per day. I try to eat ten. 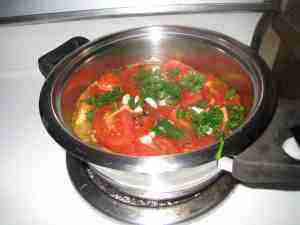 Fresh tomato recipes make a great start, and one or more should be on the menu EVERY DAY if there's a man in house! Raw or cooked. Did you make a start on your FIVE fruit and veg, say at least TWO? On a Sunday, we make a pig of ourselves, trying very hard to get five colours into breakfast. It's not difficult, and it's not rocket science; if you want to lessen your chances of getting cancer, and see the grandchildren grow up. Tomatoes have a remarkably low calories, by the way. Only 18kcal /100g (compared to bread 250kcal/ 100g). And a very low Glycemic Index of 15. The GI gives us a measure of the insulin response to various carbohydrates. The beauty of fresh tomato recipes is how quickly you can prepare them; just take this tomato relish for example. The most difficult and time consuming chore is peeling the garlic. You can throw the whole lot together in under five minutes. Add a slither of chili. Tip: chop a dozen whole chillies and keep them in the freezer. 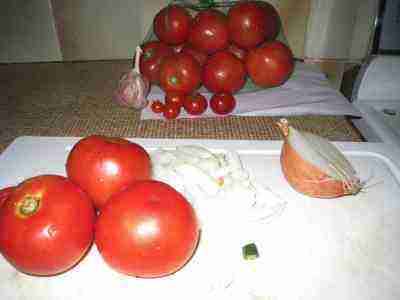 Whilst the onion and chili are slowly sizzling in the butter, chop three or four tomatoes, tossing them into the mix. 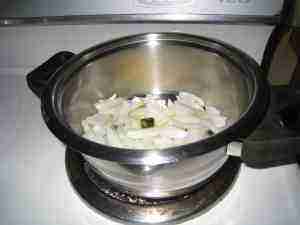 Add a tablespoon or two of water as it tends to burn. Chop a few cloves of garlic and some parsley; add them about ten minutes later and simmer for a little longer. In half an hour everything is ready. What could be easier? Butter and egg? Yes, you can eat butter, much better than margarine, if you eat all the fibre recommended. And two or three eggs a week for the high quality protein, B12, choline and lecithin is excellent. Actually since the American Heart Association has stopped frowning on and in fact recommending eggs, we enjoy them every morning on a variation of this tomato relish; it's called eggs Florentine. That choline is an essential part of the methylation of a toxic breakdown product of protein metabolism that is very damaging to the heart. 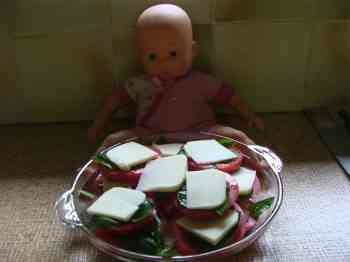 For these fresh tomato recipes with Mozzarella even the most experienced chef needs supervision! Place alternating slices of tomato with leaves of sweet basil, topped with slices of mozzarella cheese on our low gI bread; add a healthy dash of lemon juice and dribble with olive oil; it's divine. Baby Beth made sure I didn't fall over my feet. Have you ever thought of growing lemon trees? Just one in the garden makes such a beautiful small decorative tree, sweet scented of heaven; the fruit is just a bonus. A Mayer lemon is small, a magnificent decorative tree with the golden yellow fruit, and it bears almost all year round. Except in Chicago where you'd better grow them in pots and bring it in for the winter. We love the lime too, and it fruits at a slightly different time giving a longer period for making your fresh tomato recipes; and all salads, of course, need lemon juice or other citrus. 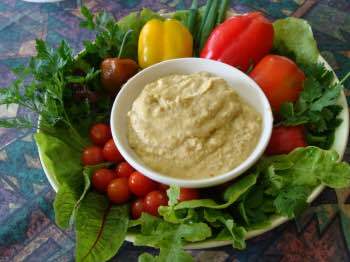 The piquant flavour will turn any dull green salad into something interesting; just add hummus, and low GI bread, and you have a delicious meal. This is what is today being called urban agriculture; it reduces waste and you know what your food's been sprayed with, and whether it's truly organic, grown using compost rather than fertilizer. Whilst your tomato relish is simmering, chop up a few apples, or strawberries, or whatever you have at hand for your fruit salad. 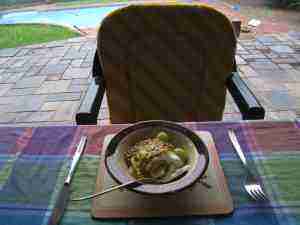 Here I have figs, grapes, pineapple and yoghurt, sprinkled with a couple grandadillas (passion fruit). One of the blessings of Africa is that there is so much fruit to be had. In Holland I would certainly have added a walnut or two. Surprisingly, perhaps, tomatoes are a fruit. Not that I need walnuts blood pressure, but we should all be having omega-3 fatty acid every day. I have to take a salmon oil capsule now and then, and freshly ground flax seed in our sourdough bread for my omega-3; there's no cold water fish to be had where we live in South Africa. 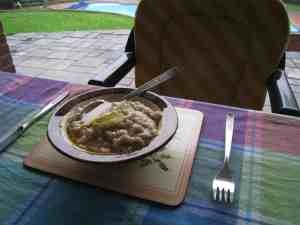 And of course the oats muesli that we enjoy most days. It's top of the list of super foods for lowering cholesterol; then you can enjoy a dollop of butter if you like hot oats porridge, and for me fresh, raw honey. That's almost impossible for you to get unless you know a small beekeeper. The so-called "raw" stuff in the shops is mostly heated, and little more value than sugar. If you are insulin resistant with a HbA1c greater than 5% then very little or no oats at all; but with full cream milk. happily I have no arthritis. Eat and exercise like this and you needn't have your life ruled and ruined by joint pain either. If you want to grow nutritious fruit and vegetables for your fresh tomato recipes, for example, then you need to start making a compost pile. Then you can have this old-fashioned tomato soup every week, with a stick of celery, of course. Add a couple basil leaves and you have tomato soup recipe. What are phytosterols is a question to which everyone should be able to give some sort of vague answer. They are plant compounds that have a structure very similar to animal cholesterol; they compete at absorption sites in the gut, enabling us to enjoy butter and eggs, for example, without guilt. Interesting: tomato for prevention of cancer of the prostate, and phytosterols for enlarged and inflamed prostate glands. It's all in the coloured fruits and vegetables. Fresh tomato recipes and olives, ah... Pickling olives is soooo easy. Just buy a big tin, some vinegar and olive oil, and away you go. Well, some chillies would be useful too. A variation of this fresh tomato recipe is creating a divine green salad, with added reds and yellows. Bernard Preston just loves tasty, healthy food, particularly those dishes like fresh tomato recipes that you can rustle up in a flash. 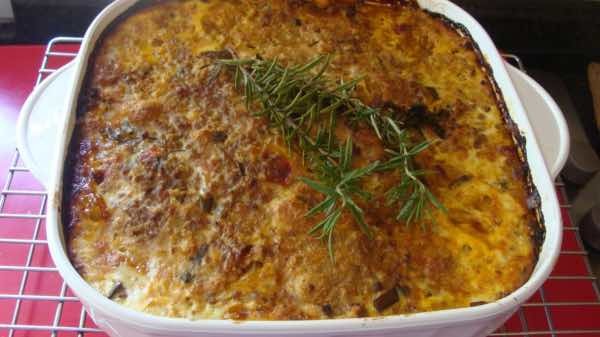 Some of course like these bobotie recipes, traditional Cape Malay fare, take a little longer; but health and taste remain preeminent; always there a bit of tomato.